A man enters a valley such as this, and at last he is quiet. All of his grandeur immediately and rightly disperses into nothingness. A most natural and healthy state is surely quickened to the light. Once in a while expose your bones to cold weather, and take with a break-away suddenness, a walk into the Winter morning to exhilarate your torpid nerves before you perpend yourself out of the experience. Let lead for once the thrill of sensation. The speed of touch and affect over bracing. Bracing means a gap of preparations, and I am calling for an instance free of the constructions and mental entanglements we’ve spun to hold on and make it through what’s yet to arrive and may never, and so make it rather difficult to just. Let. Go. And exist. Right where you are, as you are and not between points or making ground. Connected and attuned. We’re too oft in our heads and not enough in the pulse. We read terrain and trajectory of obstacles like puddles and misremember the lawless joy of our childhoods when kicking Autumn leaves and standing in the grass with no shoes on our feet was as natural as smiling, and we’ve forgotten too; that smiling can in fact precede the feeling it represents. I went out so this morning near as blank and perfect as when I was born, as the last of the blue-dark sky paled and revealed to me a restlessness in the horizon toward which I went unguarded and presenting the senses bare to the rush of impressions all. You forget, how an Arctic air can quicken the spirits, and silence the mind. You forget. It helps if there is little sun, or none to spoil the honest intimacy with its bursts of cosy cheerfulness, but above all, be absorbed, and let that be all then. Depart from your schedule with zeal into an engagement with your surroundings and open entirely to the emotional resonance with which the Universe reaches you. Receive the scene and its vastness for what it is. Embrace the rain of innervation. Permit the air to bite your lungs and tighten your flesh. Your muscles to contract and shudder, and to shake your speculating loose of taking root. A keen awareness will awaken, dilate, and throb in you, coursing your halls, weaving and electrifying, threading you back into a supernal fold, to which you belong. You are an organic being. Not simply the sum of the things that you’ve done, will do or concentrate on. It is not so much what you feel that counts, but what you think about how you feel, when you do. We were lucky with the weather, as fine days seemed to follow us mostly everywhere we went. Though it was the middle of Summer, the temperatures were as high as 30 to mid 30’s in Santiago, then dropped to around 4 deg Celsius I think, in Ushuaia. The wind could be quite fierce at times and meeting up with rain, it made for very unpleasant trekking conditions. Lots and lots of layers needed sometimes and it was always difficult to predict, changing from one moment to the next. It really is a very special place, and probably one of the better things I have experienced in my life so far. No matter now in what city I find myself, when a cold wind is such that it penetrates to the marrow, and scatters the rain into a melee of fine mist-fall visible under a street light, I can’t help but peering up at the brume be lulled smiling into memories den; down the burning corridors of the years winding and strange with yet an air of curiously warm familiarity, as an about-face that points you home after a spell adrift in the world gathering the lessons you needed to have. And I go on though wearily, knowing, towards what light I can see where glowing sits my arrival awaiting, that there is nothing expected of me there and something benign, inviting as a cabin wood-fire, easing as the welcome of a dear friend whose love by absence appreciates to a quality such as decades could not overthrow; images past of cold shining skies and golden smiles that with one look breaches the cocoon that since entombed the heart and with an alchemy of dazzling joviality encircles it. Activation! Roots are agitated. A network, from its periphery to the core engages with a dusty preparatory hum. The spaces flood with a gladdening anaesthesia and that good hibernating heart looking out with puzzled alarm, realising liberty is confirmed and at hand sighs at last a long-smothered rejoicing. The mind out of the static isolates a decibel of laughter saved, the eyes glaze a recollection. A spark catches! Sensitivity swells again, surging an affection spent. Sharp and vivid pictures of captivating scenes and painfully poignant encounters with adorable people, all hauntingly mislaid and lost to the din of fumbling busyness, come rushing now back to me but in fragments of delightfulness burgeoning, and flashes of forgotten insight like a flickering of sunlight through the dusky woods in Autumn. A story emerges out of the stuttering. A frayed slide show of a life lived so far. And it’s a glorious thing being alive and young. Perhaps more so to have been young, when you can finally figure what gift you had, and what you have now. Nature is aware the astounding splendour is, all at once too unbearable and so unfurls it she carefully, so as not to sink the senses unprepared into that seductive lower-most layer of liquid reverie from which the traveller there absorbed might not recover. With the heaping of irreplaceable love and impassable loss revisited, falling resembles flying and visa versa, and tardily will follow the relief that ever the things that took, shook you, and changed you so profoundly even happened at all, and slow to ripen is the emotional stability to stand it. These are the very things that being young, both marvellous and more difficult make: Risk without reservation, for the years ahead are many that you have to get over anything, and the soul here stands at a greater hazard by its own fearing. You leapt more. Antagonized the dangers and considered less the consequences of an etherial trusting of greater things. Divine and battered, by god, by Nature, by whatever you lived! Forget me not. Once in a lifetime friendships made in an instant and achingly touching moments that tattoo the heart and can never last. Soaring highs and crushing lows, such as you will never entirely overcome, and so you find the percepts a place of safe-keeping for the days when strength is enough. Or you will be twenty or thirty years from here standing in a room wondering why you came there because by some skip in the consciousness, your automation of thought had broken up and you forgot your reasons. Your staring out of the window now, groping in the vacancy trying to place your steps, all of them up to this point, beginning at the last time you were surprised like that, though you’ve woken with a start it seems each morning ever since. Somewhere on the other side of a deep fog where lost things dwell, and scattered like a whisper on the wind, a cry paled at a divide, faint as an angles feather falling on a cloud; an echo of a ghost trying to reach you through the noise. What to do? There is the panic and pandemonium of a siren wailing but you don’t hear a sound. And at nexus of halls are you compelled, drawn like a canary down a hole, down a passage unlit, scared and helpless, in which appears at the far off nethermost middle, at a mere bend perchance in a Labyrinthine weave of memories, a frantic, pleading, limping dot, that recedes the more with your apprehension to approach. You are afraid of course, of what might reflection find, until above all pervades a sudden understanding of a broad and foreboding necessity to resuscitate this failing glimmer in the randomness, the trying pulse of some gravely important and completed sensory brush grasped by the psyche and secured away to the recesses on purpose. Your guardians last attempt. Just as your daring rises to plenitude and looks your Goliath surmountable, you are about to lunge into the abyss of its jaws when suddenly there is a noiseless flash you can’t compute that engulfs the entire in a white wave, and in the next second your blinking up at a sun so bright and tranquillising as will appear in a dream, and it is the most breathtaking and magnificent vision of effulgence you have ever seen. You swim in the daze and drench of satisfying light beaming out over a glacial wall so mammoth and crystal-blue that can’t the eyes read a cease of its largess, nor the mind fathom a more beguiling allure. 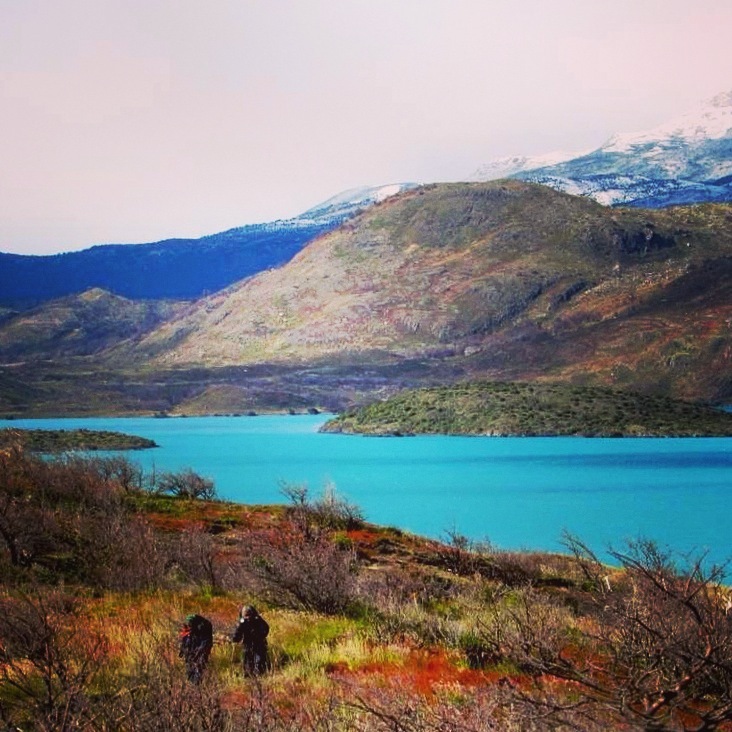 All tension melts away in that swoon, all regard for time and presence softly detaches and disperses, for here you are amid the ongoing and unbelievable that is Patagonia. It locks you up in a silence and furious bewilderment. Your smallness and responsibility moves you to tears as well a feeling of overwhelming gratefulness that you and all your disgraces should have happened upon this hallowed place in this coming together of moments perfect, and are not at all dispossessed but essential. While gazing out over the spires of those gargantuan curtains of ice, vast uninhabitable meadows of snow and water suspended, frozen in a pause for all time, glistening in the sun like dunes of diamonds and glass, in your periphery Amy is watching your watch. Smiling with a forlorn tenderness and uttering nothing because cometh the hour you’ll be too soon and forever separated in the world, she would later confess in a letter not sent. You offer no response or acknowledgement of her pensive and doting intrigue but look right on ahead, deeper into anything else as though you didn’t notice and know exactly where you’re headed but you do not, and you are just as adrift as anyone though increasingly here you are warming to the fact if by cruel expense. You don’t know why you did that, but maybe you needed to focus on yourself for a change, than rather what somebody else was focusing in on, about you. Just now a cold snap for which the faculties were not braced whips at your skin and threads the ribs. Fibres twitch involuntarily and immediately are you seized by your own constricting humanness. A glaze of frost is thrust over your nerves sending a biting shudder through your being like the cold steel of blade pushed into the chest; an ominous déjà vu which you have endured with a fright at intervals now and then for centuries. So now you look. And kneeling there in the dark by the failing embers with a curious wondering piecing together the shards of recaptured frames of my sweet Patagonian experience can I enjoy the adventure again. All the thrills of moment-to-moment living where the weeks become fortified in legend, with all the significant constellations and heroism of a lifetime thoroughly lived. From being born erratic through the journey of ‘unheavening’ right up to a dispersal composed and sublime, enhanced and hemmed into 23 days like an eon in a snow dome. A solar system within a marble sitting on the ocean floor rolling with the beckon of an undertow. As well there were exams that revealed him, who I was most proud to have become that I had until then not discovered the amounting to were at all possible. To reminded be that still he is not done, nor to be restrained any more in luxury, and too of a time in my life that I think shall ever unsurpassed remain as the very best that I had lived. When, however cutting and inclement, and no place more so than exists I’m sure, there was always close at hand the warm heart of a friend who two weeks before, you never knew or cared to know existed. Who would offer their only jacket because yours was an inappropriate match for such climates, all the while reminding the group with a stuttered yet indomitable cheer as we traversed terrain and conditions could no supposition have equaled, that somebody else whose birth place or last name you can’t recall had rushed on against the gales to prepare a fire and raise our tents before supper and storm. Those rare and special people you’ll find dotted across the globe in corners hidden and places hard, like flowers in a cave. Where scarcely known are the comforts that fatigue and drive us further from ourselves and from one another. These very much-mattering, endearing acts of unhesitating consideration you can come to expect on the road from strangers who would rather be family. And as much as I’ve wandered from shore to shore, through valleys low and stark not within lights reach where prevails still a most fascinatingly and animated little civilisation you’ll not find anywhere else that one dare not profane to long step there, – and there’s such a place for us all; among grand and agleam peaks of powerful majesty weeping into lakes of the purest blue that arrest the tiny looker into a sudden compulsion for silent propriety: More than any mountain, the human phenomena of immediate unreproach and dependable tenderness never ceases to fire me to new incentives for compassion and service, always bringing me home a better man, and upon me after the hardest days, bestowing a far better rest than I could have hoped for. To see it, be touched, punctured and set loose by it is a wrath of pleasantness intensely I pray for and to what I know not. Perhaps to the Cosmos which inform with its patterns of seeming disarray and yet precision of order and celestial fairness. If it can pull planets, kill stars and toss fire like missiles across an infinity and still find occasion to mystify us with a drifters faith and the honest goodness of foreign folk, music, love, drunken sunrise pacts with new friends and pretty smiles in passing, surely can it inspire us to consider less ourselves as a disconnected self and more as a part of an order serene, that we may then tirelessly to the work of prospering an entire people to a standard of aversion to such separateness, and encourage by bitter example the kind of society we would all admire, and for which would one tilt to all the winds and blades of a thousand Siberian assaults for. Finding in our unity, a strength not stirred without, we can exhilarate that which sorely requires the present wide world through which we stumble: that is, dissolution of that indifference, that, until recently I had championed for too long and thought to be a trait of the strong, which I know now of course to be untrue. Passing through the tunnel of a curative meditation are you restored. A buoyancy finds again the space beneath your feet, careening within and through you. Things are far gentler than you imagined. There is breadth at last, for all the things that you would feel, and the few things of which reason guides you need think. It is not as much a vacation as we need so much as an hour quiet and sincere with the soul, where your work will become known to you, to be taken up in earnest for all the days of your glorious tenure until it descends upon you to sleep and take your leave. Can it not be said, that only he can meet calm and relief who is storm-worn and standing and who has not stumbled thus his respiring? Who has allowed his balance to find him by at last keeping still though else nothing is, and having flung to the gusts for the valley below his charge and strain of striving vain. By not gripped by the incertitude of factual things such as winds and aims, they ceased to fatigue him and fell away into vanishment the more he fought them not. He has seen his depths and caring less for heights is happy if he can burn the day sitting on the adret of his Himalaya, to finish a good book and gathering there in himself like the snow and sunlight around him, and passing unhindered through his own being like the tide of ordinance. If you chance reside near the ocean, a shimmering freshwater basin perhaps, or some sparkling sky-blue inlet stream brushed with the green-apple tips of Willow that whisper in the Springtime breeze, and stir with timid charm the clear and delicious waters passing underneath through which the pebble floor and all animation of life therein is visible, into the shade of an Arcadian dale. Bubbling liquid of the purest dreamable state drawn and descended of lofty snow-laced spires which address the very cloud-scape grounds call angels home. Well, have you then at your grace, wanderer, a fount of the finest available natural sustenance known, and necessary wealth, of which you too are mostly comprised, sufficient in one gratifying instant of submersion to dissolve your cares and quicken the spirits there back to ambrosial health and exquisite humour. The holy sinking sensation of being one and relation to Nature, suddenly home and alive again. I have been several uncompressed days, without an account of my becoming, and delighting in the contours and tone of a new morning sky has long been increments clear of reach. For those wonton days leave little to heave upon the pages then, and all the disenthralled while I was courting distraction has Nature borne the lonely anniversaries with hushed distress, waiting at the window dressed in Spring light. Your mundane duties, forswear. Come back to me. Man, never your eyes avert, whence being gone must some part return; to reconcile with Universe.